I want you to think of the main event that happens on the 4th of July…Fireworks you say? Wrong! 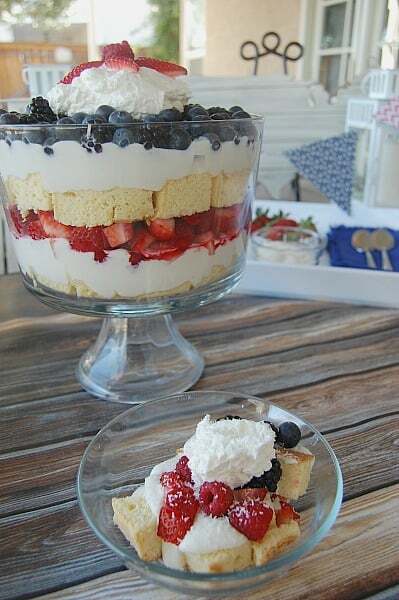 It is going to be this coconut berry shortcake trifle! 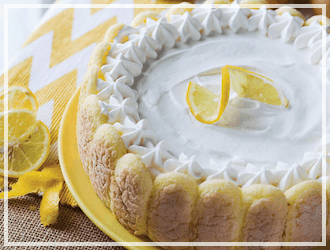 It’s festive, flavorful and oh so fun to make! 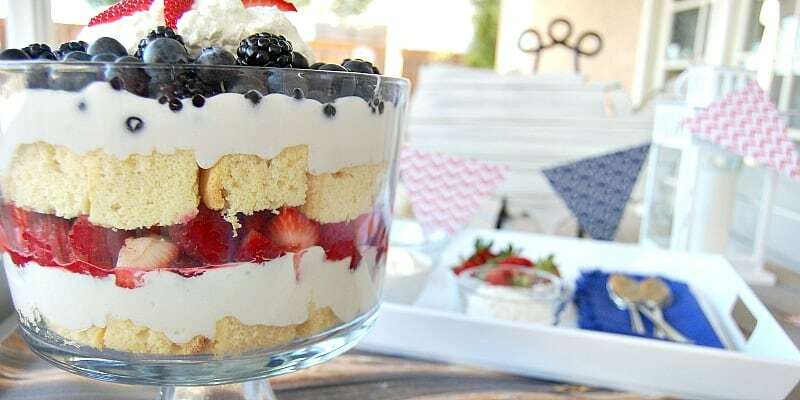 Layering my homemade coconut cake with coconut cream and the red and blue berries is sure to make a bang this Independence Day…or any day! 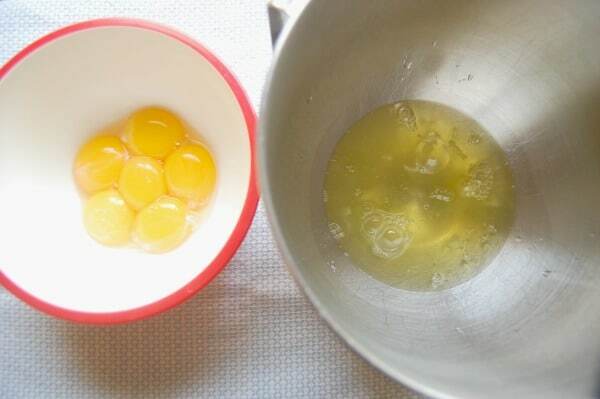 Start by separating six eggs. The whites go into the bowl of a stand mixer. Let the whites sit at room temperature while you use a wire whisk to beat your egg yolks for about a minute, until slightly thickened. 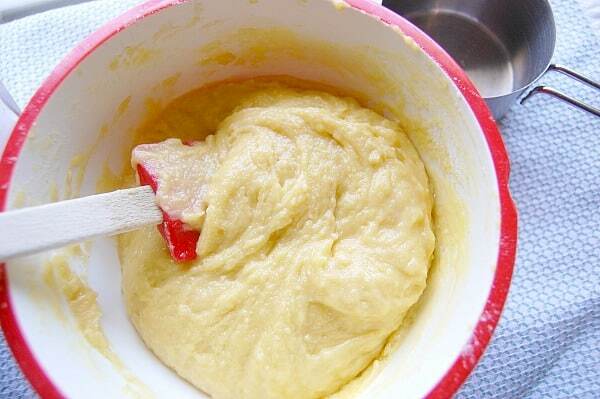 Add 1/2 cup of sugar and continue to whisk until thick and lemon colored. 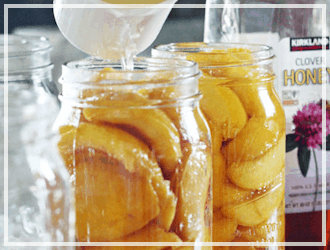 Incorporate your lemon juice, melted coconut oil and water. Add your flour, coconut flour and salt. Stir just until combined. Set aside. 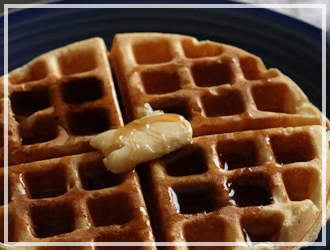 Now its time to beat your egg whites. 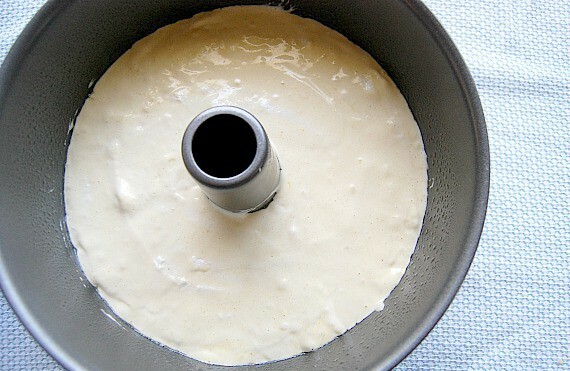 Using a whisk attachment, beat on medium speed until a soft peak forms when you pull the whisk out. Add 3/4 cup of sugar and beat on high until you see a stiff peak on the end of the beater when you pull it out. 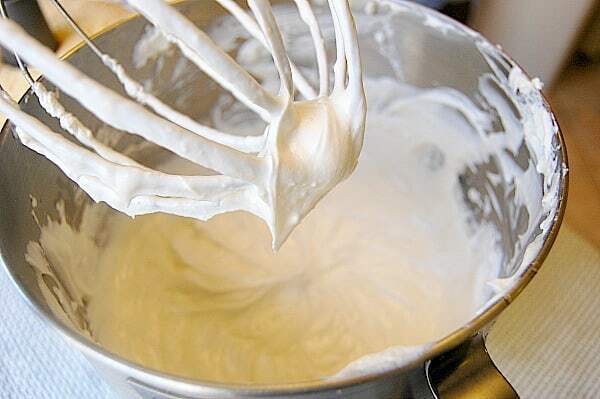 Take a few large dollops of your egg white mixture and fold it into your batter. Gently people, we want it to stay fluffy and full of air. Now add this yolk mixture back into the egg white mixture and fold just until incorporated. Don’t worry about getting all the egg white lumps out. 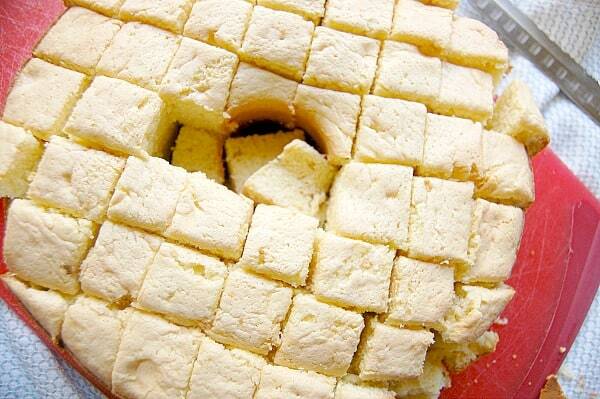 Place into a greased angel food cake pan. 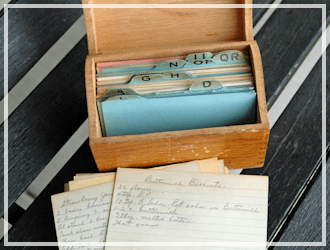 You can also use a loaf pan or two 8 inch cake pans. However, I feel like it cooks more evenly in a angel food pan, and it’s easier to remove. 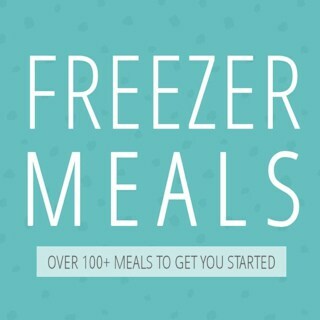 At this point, make sure to wash and dry your mixing bowl and whisk and place into the fridge for at least 30 minutes or about 5 minutes in the freezer if you are going to be making the cream right away. Isn’t she a beaut?? Now some of you who know your cakes, are crying, “why, that’s not a shortcake at all! !” (per my title). Yes, you caught me. But I can’t use the words strawberry and cake in the same sentence without throwing in the word short. Call me crazy, but I hope you understand! This cake is amazing though! It is a mix between and angel food and a pound cake. It is light and airy but it holds its form very well. It tastes lightly of coconut and is not too sweet! 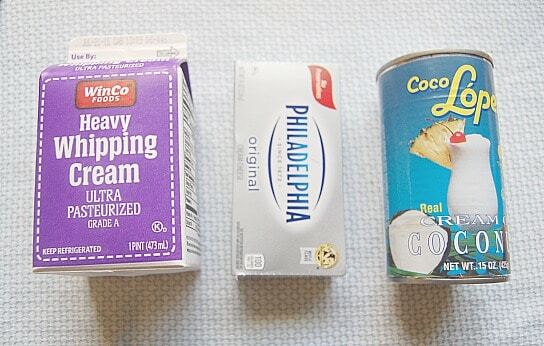 Only three ingredients for the coconut cream! 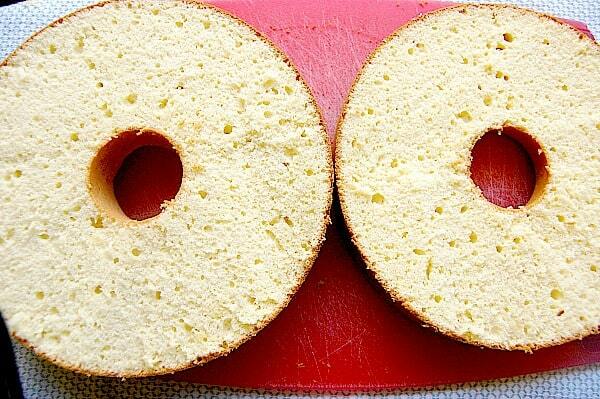 Make sure the cream cheese is softened. If you are wondering about the cream of coconut, you find it in the alcohol section of the grocery store, by the margarita mix. Do not be confused with coconut milk which is in the asian section. Nod if you understand…great! Lets get to whippin’! Take your clean and cold mixing bowl out of the freezer and pour 1 1/2 pints (3 cups) of heaving whipping cream into the mixing bowl and whisk on medium speed until slightly thickened. Add powdered sugar and vanilla and beat on high until very thick! Refer to the picture above. 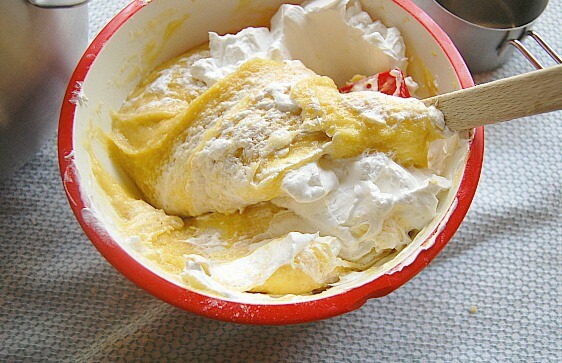 Remove all the whipped cream from the mixing bowl and set aside. There is no need to wash the mixing bowl. Throw your softened cream cheese in and beat until the lumps are gone. Add the can of cream of coconut and beat until smooth. 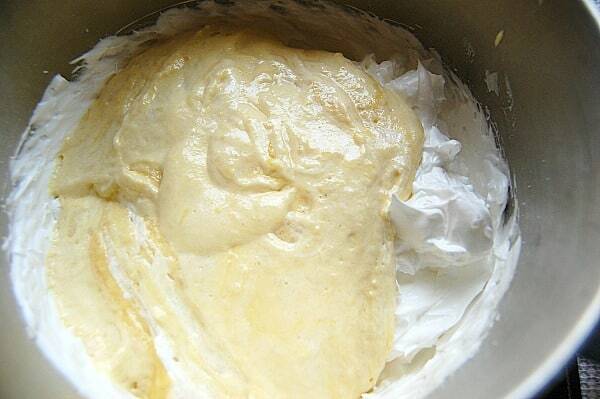 Then add about half of the whipped cream mixture in and beat on medium just until incorporated. Cover and reserve the remaining whipped cream in the fridge. Also, keep your coconut cream in the fridge if you won’t be layering your trifle right away. 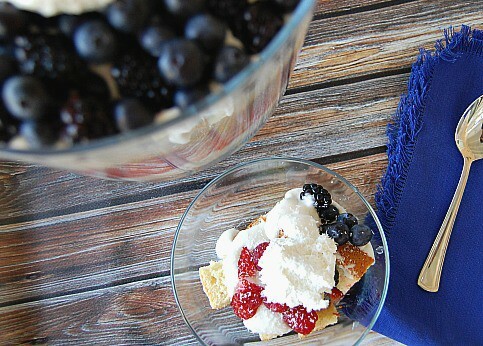 Combine your raspberries with strawberries and your blueberries with blackberries. I sound like Willy Wonka! Cut your cake in half. At this point, if you wanted a cake, you could layer the coconut cream and berries and place the top back on. 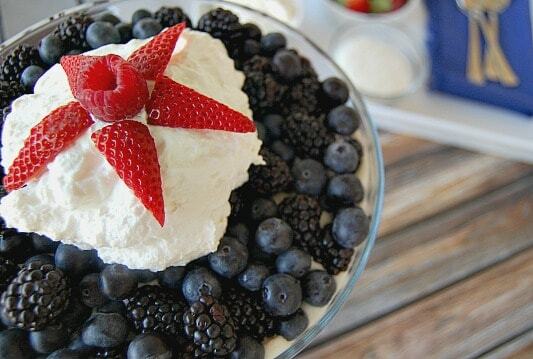 Spread with more coconut cream, fill the center with whipped cream and pile on some berries and you’re set! But keep reading if you want to make the trifle version. Stack the top back on and cut into cubes. 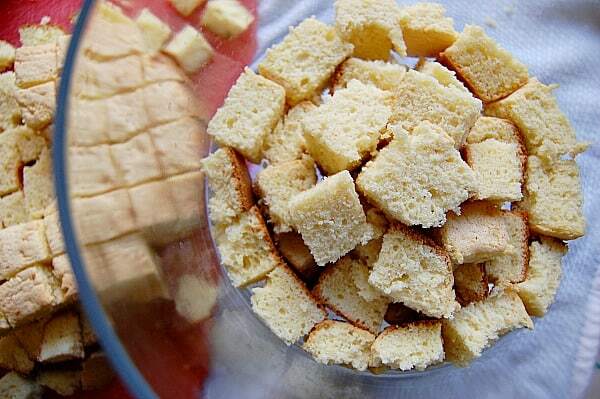 Layer the bottom of your trifle dish with cake cubes. Make sure the you are pressing the cake against the side of the glass with only the white part showing, face the darker edges inward. I also like to make a little mound of cake on the middle of the bottom layer. 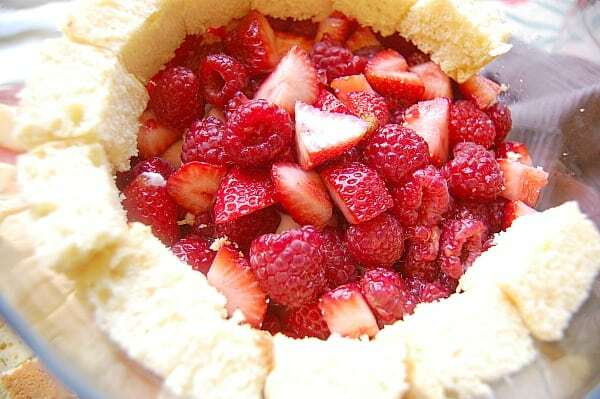 It gives the finished trifle a more rounded appearance instead of flat or sunken it. Layer the coconut cream mixture, starting at the edges and working toward the middle. Repeat with the berries (fill the edges first). Reserve only the berries you wish to garnish with. Repeat with the cake layer, the cream layer and the blueberry layer. Garnish with your fresh whipped cream, and the berries of your choice. 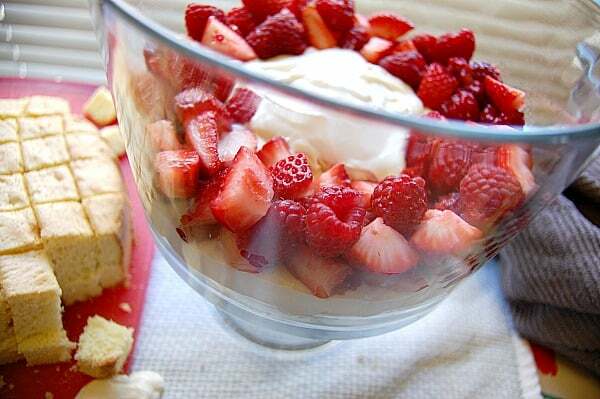 Here are a few reasons why I love this coconut strawberry shortcake trifle. 1. 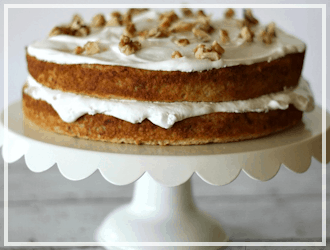 It is so versatile — Switch up the berries, switch the cake, switch the serving dish! 2. The flavors work so well together! 3. It serves up beautifully. I like to serve it with the remaining fresh whipped cream and a generous sprinkling of unsweetened desiccated coconut. If you don’t have a trifle dish? Consider making individual servings in clear plastic cups, or letting people serve the ingredients buffet style. You can even serve it as a cake! I love how versatile it is. Short on time? 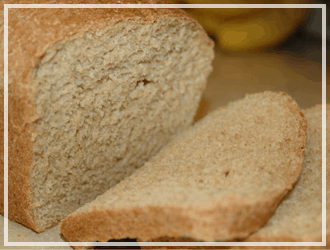 Use a store bought pound cake or angel food cake (I like to mix both) and this recipe can be ready to serve in 15 minutes! 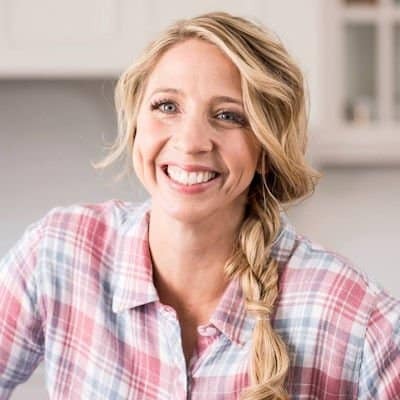 Looking for other recipes to spark up the 4th? Try my Barbecue Brisket. With minimal prep work, this is the perfect 4th of July meal. You can throw it on the grill and hang out with family as it slowly cooks. Use your extra strawberries to make my Chia Seed Strawberry Jam. 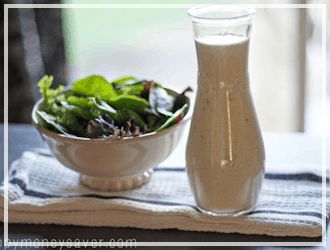 It’s a healthy and delicious way to get back on track after all the holiday food and treats! Like I said before, this recipe is so versatile! 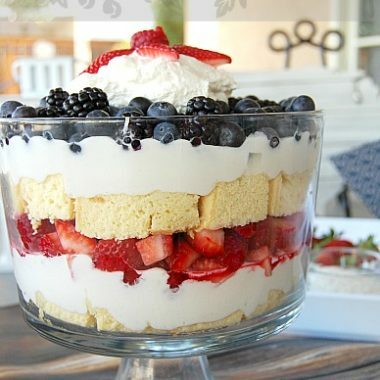 I would LOVE to hear some of your favorite ways to make your trifles or if you made a variation of this one! And feel free to print out my recipe below to make it easy! Make a bigger bang than the fireworks on the 4th of July with this coconut berry truffle. 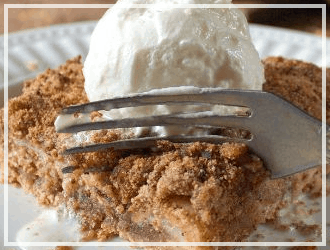 This dessert is light oh so flavorful. Your guests will be completely satisfied without feeling sick! Separate the eggs and place the whites into a large mixing bowl and let sit at room temperature. 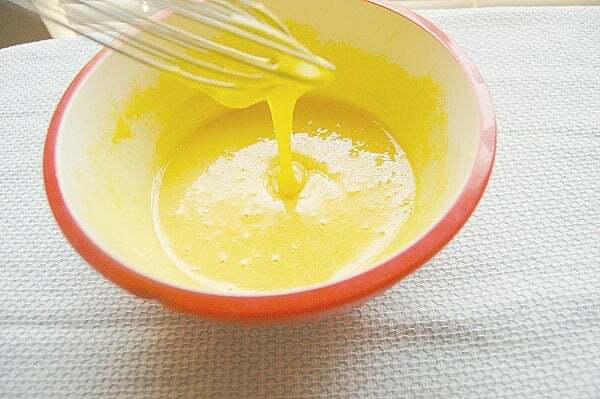 Beat the egg yolks in a separate bowl with a whisk until slightly thickened, Add 1/2 cup of sugar, whisking until the egg yolks are thick and lemon colored. 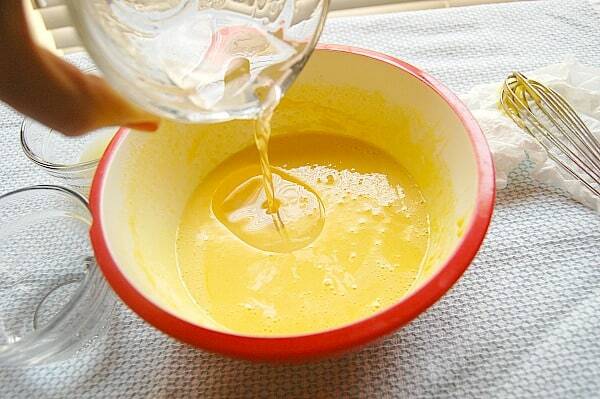 Whisk in lemon juice, coconut oil, and water. Combine the flours and salt and add it to the yolk mixture. 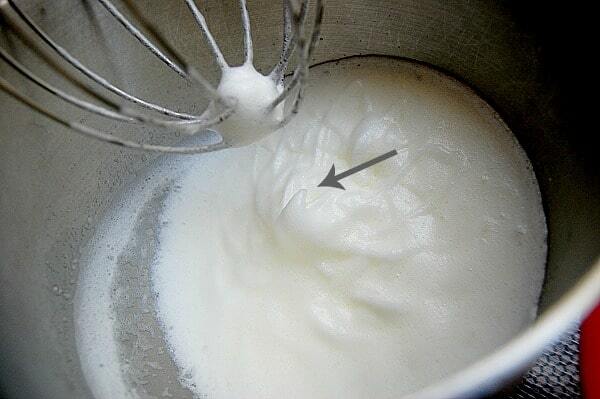 Beat the egg whites on medium speed until soft peaks form. Gradually add the remaining 3/4 cup sugar, beating on high until stiff, glossy peaks form. 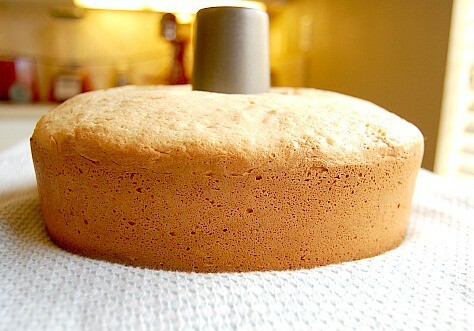 Spoon into a greased angel food cake pan (or two 8 inch cake pans), smooth the top. Bake at 325 degrees for 40-45 minutes until the cake springs back when touched and is lightly golden brown. Remove the side of pan and let cool completely. Wash mixing bowl and whisk, and dry well. Place in the freezer for 5 minutes. Beat the cream until it begins to thicken, then add the powdered sugar and vanilla until it is very thick and dense looking. 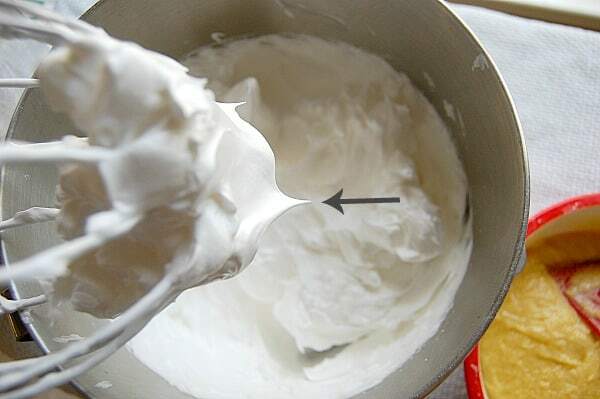 Remove all the whipped cream from the mixing bowl and reserve. Immediately add softened cream cheese, and beat for a few seconds, add the cream of coconut and beat on medium until combined. 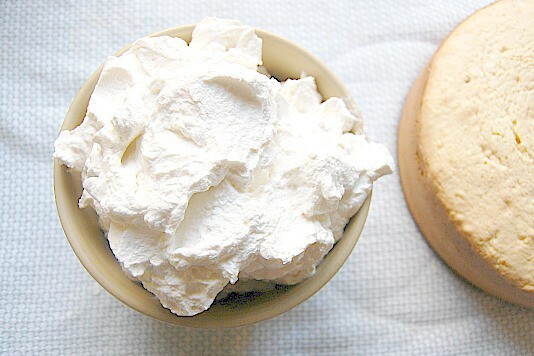 Add in half of your whipped cream to coconut cream cheese mixture and beat on medium speed until combined. 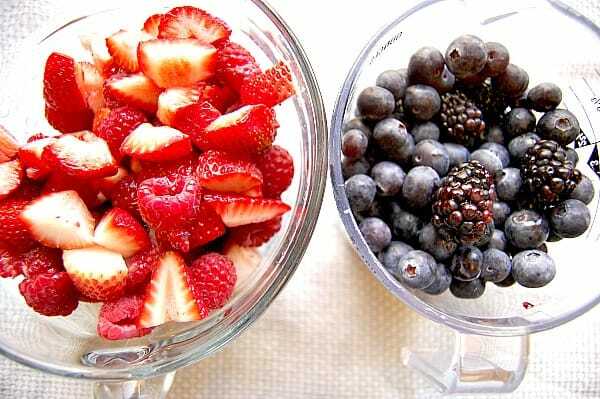 Wash and dry your berries, combine the strawberries and raspberries in one bowl, and blueberries and blackberries in another bowl. Layer the bottom of your truffle dish in a single layer with cake, make a small mound of cake in the center of dish. Carefully spoon on your coconut cream in an even layer. Layer your red berries. Start with the outside making sure that you have enough to make the layer even, then fill the middle. Add another layer of cake. Another layer of coconut cream. Add the blueberries and blackberries to the top. Dollop with fresh whipped cream and garnish as desired. Serve with the remaining whipped cream and shredded coconut to top. 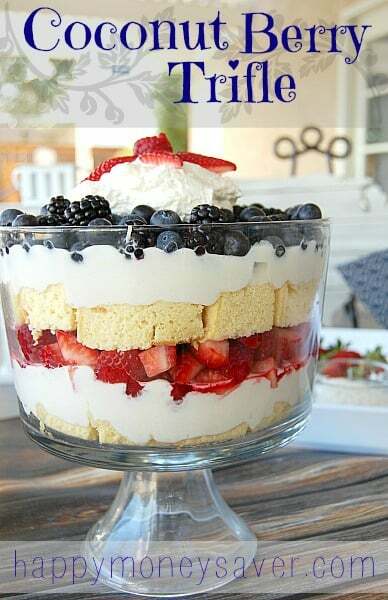 I just made Coconut Berry Shortcake Trifle Recipe and it was super ever! Thanks for the sharing the recipe. Can’t wait to make more them. This looks delicious! My husband doesn’t do a lot of traditional sweets (no cookies, brownies, etc.) but he does love berries. One of his favorite Holidays is the 4th of July (he’s military) so I’m pinning this now to make for him then! Yes, this is one of my favorite go-to’s for 4th of July!